With a range of skills and experience, the SBMS mentors can help you prepare your business for the future so you can achieve your goals. Mentors can help with business planning, online and social media presence, pricing, sales, marketing, bookkeeping, staffing, merchandising, negotiating and much more. You’re invited to learn more about the free and confidential one-on-one business mentoring offered through Trader Connect. This is your opportunity to meet Katya Ellis and team from the Small Business Mentoring Service (SBMS). Drop in for a chat and see how the mentors can benefit your business. Due to leave arrangements, there will be no Victraders posts this weekend. Posts will re-commence on 30th May with normal content by next weekend. Thanks, and apologies for any inconvenience - Ed. Car Parking on Queen St – this photo was taken at around mid-day on Friday. It is amazing how much extra space you create for customers when traders are banned from parking in prime locations. to find leather like this." Celebrity Customer – Mino from JLP regularly posts photos on Facebook of his customers. It is all part of social media engagement. This photo taken on Friday is of Jazz Legend, Henry Butler. Malaysian Conference Customers are still in town according to one of our souvenir traders. String Bean Alley contenders – we understand there are now two containers up for grabs and a decision on the successful applicants is expected early next week. Sally Capp – there is only one black mark against our new Lord Mayor according to one trader. Actually it is a black and white mark. She was on the Board of the Collingwood Football Club. String Bean Alley – apparently management are talking about charging SBA traders more for the Night Markets and possibly limiting the term of tenure. As a few traders have said – all of a sudden SBA looks less attractive. 1. Red Rooster franchisees claim to be on the verge of bankruptcy. 2. Convenience store sales slow. 3. Ali-Baba posts record number of transactions. 4. Baby Bunting downgrades guidance. 5. Starbucks and Nestle join in marketing partnership. 6. NAB says “concerning signs” for the retail sector. 7. Supermarkets save March retail figures from decline. 8. Godfreys recommends acceptance of private purchase offer while at risk of default. 9. Amazon reported to be interested in UK’s Waitrose supermarket chain. 10. JB HiFi in strife with ASX over earnings downgrade. 11. Big W still “a work in progress”. 12. General Pants Co. brand collapses. Administrator winds down operations. 13. Calvin Klein, Tommy Hilfiger wholesaler looks to expanding own store network as department stores falter. 14. Uber questions its partnership with Coles food deliveries. 15. Walmart buys Indian marketplace, Flipkart, for $21.4b. 16. Oroton sells off The Daily Edited Brand. 17. Myer loses more than 50 concessions as retail woes take hold. 18. Gloria Jean’s owners face class action over franchise model. 19. First Peter Alexander Junior store to open at Highpoint. 20. Specialty fashion Group offloads major retail brands Rivers, Millers, Katies to Noni-B but keeps City Chic. 21. Your Grocer buys Aussie Farmer Direct. 22. Coles and Woolworths limit access to baby formula. 23. Extended summer hits Myer sales. 24. Woolworths use scale, faster supply, and freshness to impact on independents. 25. Zara Australia’s second largest investor sells out. 26. The Iconic trials one hour delivery. 27. Insolvency specialist says May is one of the worst months for retail. 28. Macy’s says improved outlook for physical stores. 29. McDonalds introduces world first at Sydney Airport with kitchen above serving counters. 30. Starbuck’s China to double store network. 31. Luxury watchmaker, Richemont (Cartier and IWC) buys back store stock to reduce chance of discounting. China’s ban on importing recyclable waste has created a crisis for Australia’s packaging industry. Recycling is now less of an excuse for creating and using plastic packaging. One of the wonderful things about our City of Melbourne is the organisation’s transparency and the ability to often find the background to events. The online audio of the last Future Melbourne Committee meeting on 15th May has given insight into Councillors response to The Heritage Victoria decision to refuse aspects of renewal. It makes for interesting listening. Essentially the city was given a two line decision when Heritage Victoria issued a refusal to the dismantling of Sheds A-D at QVM prior to building a key underground facility as part of the QVM Renewal process. The sheds were to be repaired and replaced but Heritage Victoria were not happy with that proposal. The Council fully expected that if Heritage Victoria had problems with the proposal, they would seek discussion with the City, but that didn’t happen. A two line statement was all they got. The City had the option of appealing the decision but they decided not to, and it would seem that they had two reasons. Firstly, when the Heritage Victoria 30 page explanation finally came out it was apparent that there were a number of aspects of the report that Heritage and the City would be able to reach agreement on. Secondly, an appeal would be time-consuming and expensive. As Councillors debated what action they should take, it was clear that many still had strong adherence to the original business case which pushed for underground location of facilities and vehicles so as to maximise the above-ground floor space – almost doubling it. Councillors pointed out that the 2 alternatives put forward (putting a carpark over the burial site that is the current car park, or exhuming the bodies and transferring them) were both completely impractical. Clearly in their view the current car park is best optioned as park land. Interestingly, it was suggested that they could simply apply to have the car park under Munro’s increased by 200 spaces if they had to fix the vehicle placement issue. There was discussion about the skill-sets that had been developed globally to carefully manage market deconstruction and replacement (Borough Market and Barcelona). There was also discussion about claims of “majority support” be opposing groups at QVM with neither able to really verify their claim. Clearly there are many different views in this matter. Then there was speculation about the possible mandate of two elections for Lord Mayor. 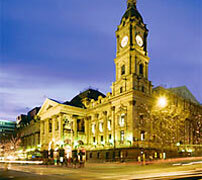 We now know that the last two elections for Melbourne Lord Mayor have been won by supporters of QVM Renewal. A number of Councillors felt that an appeal should be launched, and Heritage Victoria taken to task, but in the end a more pragmatic approach was taken and the City decided to launch a fresh proposal and re-engage with all the stakeholders. That proposal will be developed over coming months. The full audio can be heard on the CoM website. A new market is planned for Docklands, near Costco, and of course not far from QVM. It is to be called The Market. In fact it is just another shopping centre with a large Woolworths supported by a variety of Butcher’s, Deli’s, Bakeries, and presumably Fishmongers. But, “just another shopping centre” may be too dismissive if recent trends are an indication. Supermarkets are increasingly moving into market territory with the depth, range, and freshness of their offer and this one seems very focused. 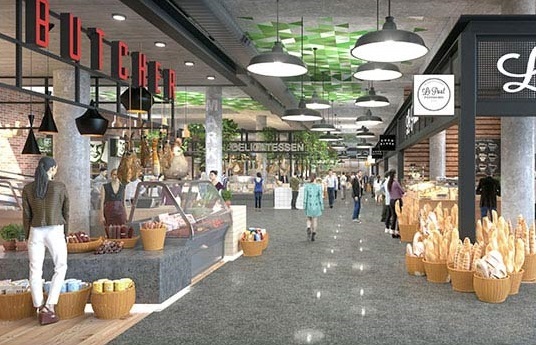 "The Market will be home to a full-line 3,800sqm Woolworths supermarket, alongside a large scale Asian Grocer, a fresh food marketplace, Dan Murphy’s and some of Melbourne’s best gourmet experiences, to complement Costco Docklands. 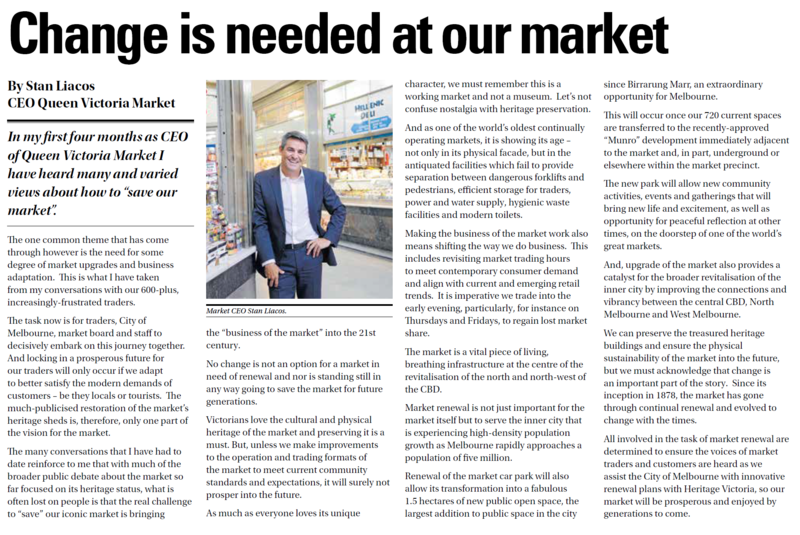 The Market is part of a $150 million overall re-development of the centre." 1. Providing facilities and services that meet consumer expectations. 2. Supporting market traders to enable them to be the best they can be. 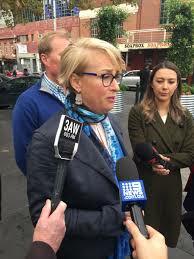 The first directly elected female Lord Mayor of Melbourne, Sally Capp, spent her first day since being elected at our Queen Victoria Market and immediately promoted a new renewal push with trader engagement a major focus. “I’m absolutely confident that we can come up with a plan that continues to preserve the character and heritage of this amazing market while modernising it so that we can improve the experience for traders and shoppers,” she said. Ms Capp has talked about a new commission to oversee the market renewal and draw the various parties together. Many traders were scared off by what some called “a bloody great hole” and if a commission can encourage a less disruptive solution that would seem to be a good course. Although as one trader pointed out, the “do nothing” camp will need to show some potential for accepting change and preparing our market for the future. Sally Capp has significant credentials – Prior to the election she was Victorian executive director of the Property Council of Australia. She began her career as a solicitor and has held senior posts at KPMG and ANZ. Her other past roles include CEO of the Committee for Melbourne, chief operating officer at the Victorian Chamber of Commerce and Industry, Victorian agent-general across Europe and Israel and the first female board member of the Collingwood Football Club. She is also involved in a number of charities and currently sits on the board of the Olivia Newton-John Cancer Research Institute and the Mary Jane Lewis Scholarship Foundation. She is also a board member for the Melbourne University Faculty of Business and Economics. Sally Capp achieved just over 25% of the primary vote in the city election with her next nearest rival getting just over 15%. Do you feel saved? 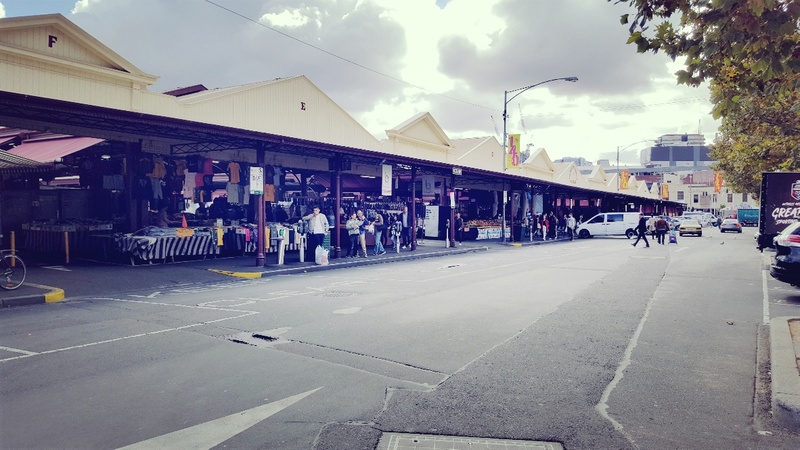 Today’s Age says the Queen Victoria Market has been saved by people power. Why don’t I feel saved? The headline follows a CoM decision to abandon a key component of renewal which is the removal (and replacement) of market sheds to construct underground facilities. I can see that four open air sheds have possibly been saved from some misadventure during replacement. But if I can play around with words for a minute this has been more about "wasting" than saving. Wasted time, wasted effort, wasted finances, and the list goes on. Now we are going to go through 6 months of reassessment and a new proposal that will ask CoM management “to work with Heritage Victoria, traders, customers and other key stakeholders.” Mercifully, 6 months is a short time. The other word that comes to mind rather than saving is “stopping”. There has been a lot of “stopping”. Stopping is quite easy to achieve. You just stand in the way of things and block wherever you can. Stopping is a hell of a lot easier than progress. Stopping does protect you from scary new things but it also means that things don’t change, and when your business is declining, that is critical. Stopping can be just as wrong, as runaway enthusiasm. It is very difficult to get the right balance. Let’s make it clear - in my book “saving” means measured progress, improvement, and preparing for the future. The biggest problem facing QVM is not protecting old buildings but protecting a way of doing business in the middle of a global business revolution. I have attempted to avoid blame in this little rant. The truth is that we are all to blame either because of complacency, self interest, or failing to communicate properly. Only considered, professional, and truly co-operative engagement will work here. Until then you can keep “saved” in your back pocket. I have definitely not been saved. But I remain hopeful. 19/05/2018 16:23:28 Saved "This presents an opportunity for a clean slate. The against group for renewal has been guilty of stopping renewal at any cost. The CoM has been guilty of assuming they could proceed with their plan without a serious attempt to justify their plans and communication has been well beyond poor. If the Renewal wasn’t temporarily halted it was doomed to fail with both groups fighting each other. 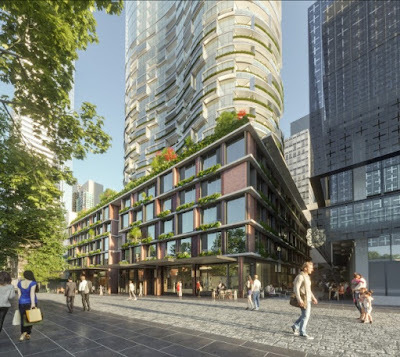 Although frustrating perhaps this will give both groups a chance to realise that the core of a renewal will be a strong plan to revitalise the retail environment at QVM - the buildings are at the end of the day, just buildings. It is surely a last chance scenario now so let’s hope we can genuinely work together to get it right this time"
The construction of a $450m complex on the Munro’s site opposite QVM has been given State Government approval. The Australian Financial Review is reporting today that construction is expected to get underway within weeks. The first stage of construction will involve 56 affordable housing units, a 120-place childcare facility, family and children's services centre, a community centre, and a 503-bay car park. Following stages will include an apartment tower and hotel. The City of Melbourne has decided not to appeal Heritage Victoria’s ban on temporarily removing the western end of sheds A-D in order to construct underground facilities. We understand the sheds will not be removed. The CoM had a choice of appealing the Heritage Victoria decision and engaging in protracted legal argument, but has decided to work with Heritage Victoria and stakeholders to come up with a new proposal for achieving its renewal aims. Subject to Council approval later this week, it is expected that 6 months will be spent coming up with a new proposal. The proposal will need to include provision for car parking originally intended to go underground at Sheds A-D and supplement the parking already planned for the Munro site. Those measures will enable the current market car park to be converted to park land. Whatever the outcome, traders will be looking for a speedy, non-disruptive, solution. A Tram Under The Sheds – Why aren’t we adopting one of Melbourne’s icons says one trader. Melbourne’s trams are a great attraction for the city and an old tram on Queen St or even under the sheds could be a real point of difference. Imagine a tram set up with micro stalls or as a food outlet with stalls hanging off it. If you put it under the sheds, you could incorporate it in Night Market activities. It sounds like a great idea. What do you think? 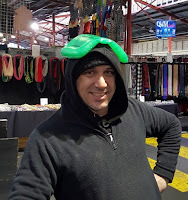 New Winter Attire – Mick swears this headgear was just the thing for Friday’s cold winter blast but do you think we should tell him about the impact on his dress sense? A Car Park Idea – this trader thinks we should immediately move all C and D Shed traders over to J-M Sheds. This would create a vibrant market offer without all the current gaps and allow the vacant space in C and D to be used for car parking. The considerable income generated from car parking could be channelled into promoting the market. 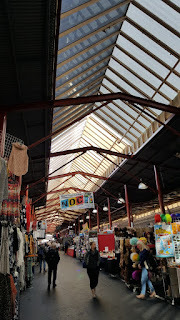 Weather Protection - A trader has reminded us that the market was first built in the 1870’s with open air aisles but when the custodians of the market decided to create new sheds (K-L) in the 1930’s, they designed continuous roofing as the most appropriate way to manage market activities. Why is that so hard to grasp when it comes to F Shed and SBA in 2018? J Shed Sun Protection – meanwhile shading has been installed in a trial section of J Shed to minimise the impact of heat and sunlight degradation on some products. Sun protection has been an issue in this aisle for a long time and it is great to see action being taken. The shade panels can be removed to adjust light entry and traders will be watching the impact of this measure over coming weeks. Stall Cancellations - thanks to one of our Market Officers for pointing out that the Operational Mobile Number (0418222119) can be used for texting stall absences. If you are not happy with the standard stall cancellation phone number (where you leave a voice message) you can text the Operational Mobile Number and have a record of your cancellation. Trader Outed For Non-payment of Rent – it doesn’t happen very often but apparently a trader has been excluded from trading because of excess rent owed. Generally these issues can be worked out and the secret is to talk through matters with management. A Wonderful Sight – a number of traders said how good it was to see buses queuing up on Peel St. to off-load delegates from a Melbourne conference. On this occasion the business seemed to stop at souvenir sellers, but business is business, no matter where it comes, from and who benefits. Another Wonderful Sight - was the souvenir trader at the bottom of LShed on Friday at around 3:30 , who had delayed packing up due to a bus load of tourists turning up. As the rest of the market packed he experienced a frenzy of buying. The Vacant SBA Container - apparently 21 applications were received for this container and 5 have been short listed for interviews next week. 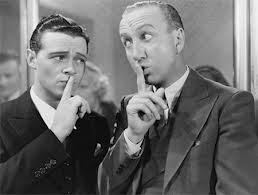 13/05/2018 12:33:48 Conference Delegates "Would it be possible for someone to do a quick survey from Stallholders and ask a simple question, did the conference delegates have an impact on their takings....lm guessing 95% would say NO,unless your product line is between $5 & $10 these type of customers have little impact on the majority of stallholders." 13/05/2018 23:39:01 Conference Delegates "A posable 2300 delegates visiting the market over the course of a week and some traders still are not happy .Maybe there never happy. Many were purchasing cheaper items but in good quantities and with that many people circulating the sheds that has to be a good thing for the Market and they were buying food & drink while here as well. So spreading the love. Perhaps other traders will benefit from future customer demographics . In the meantime every little bit helps. " 13/05/2018 22:46:33 Car Park Idea "Think it through . A car park between A&B and E sheds .Are you going to build an access tunnel or bridge for customers oh&s and would cars be entering or exiting Queen st for traffic flow ??" Damn! I hate it when a good idea gets shot down by logic. But, quite like the bridge idea - sort of a forest canopy walk over the rooftops. Thanks for your input. - Ed. 16/05/2018 14:26:54 car park idea "Wouldn't the Victoria St shops and A & B sheds be disconnected from the rest of the market community with 2 aisles of car parking in-between them." Yes they would, and we need to think it through as our previous poster suggested. A lot of pedestrians use that top walkway to navigate between different sections of the market. Thanks for your input - Ed.